Chengdu is a important economical and cultural hub in southwest China. Chengdu is known for its friendly and relaxed lifestyle. Tea house is an important part of Chengdu life. If you are living in Chengdu, you can find tea house at any place of this city. 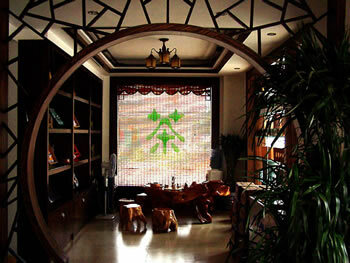 Having a cup of tea at a leisure tea house provides you a deeper understanding of ancient Chengdu. Tea house used to be an information exchange place. Chengdu is an inland city, transportation was not convenient as coastal cities in old days. So young and old people go to tea house, have conversation with each other and share their information. Then after thousands years, tea house became a special custom in Chengdu. Sitting in the bamboo chair at tea house, enjoy the waiter filling your tea cup with a copper teapot, and you will have a very deep impression. If you want to know more about Chengdu tea culture, Mandarin House is your best choice. Mandarin House Chengdu Chinese school in the premier Chinese school in China. We aim to provide quality and enjoyable Mandarin and Chinese culture learning program. Our teachers are experienced and highly qualified professionals who are committed to delivering the highest caliber of Chinese courses. All courses are quality assured and ensured all of our students learn to their full potential. If you have any question about Chinese culture in Chengdu or Chinese learning. Please do not hesitate to contact us.